Chase Rice has spent years honing his live show to deliver the same level of passion and intensity that he demands from those who come to see him perform. Having cut his teeth “playing to the most discerning crowd there is: college kids” (Pollstar) and opened for veteran entertainers like Dierks Bentley and Kenny Chesney, Chase has learned a thing or two about what it takes to engage a crowd – and it’s that rare energy he looks for in selecting his own supporting acts for his upcoming JD and Jesus Tour. Chase is calling on a diverse slate of talent to fill out the bill when he embarks on the tour this fall, tapping Dot Records’ Tucker Beathard, Arista Nashville’s Cam, EMI Records Nashville’s Haley Georgia and up-and-coming singer/songwriters Luke Combs, Jordan Davis and Cole Taylor to join him for select shows. 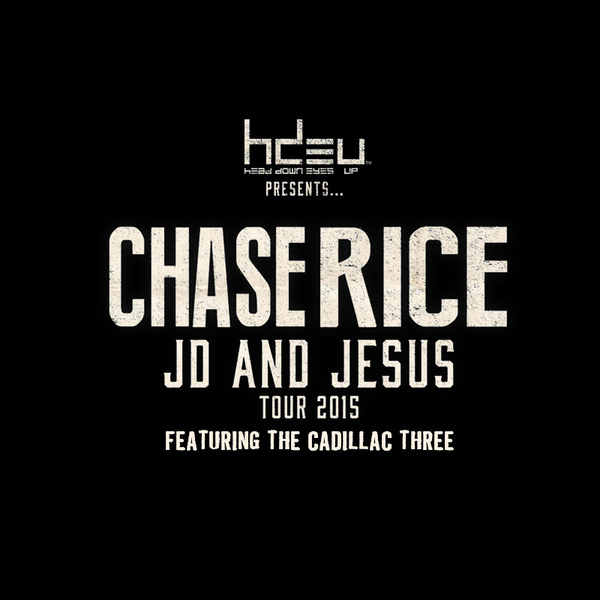 He is also extending the JD and Jesus Tour into 2016, with more dates announced today. Chase has championed innovative new artists since his first headlining tour in 2013, when he brought fellow boundary-pushers A Thousand Horses and Sam Hunt on the road for his Ones To Watch – Ready Set Roll Tour. For his 2014 Ignite The Night Tour, Chase tapped rising country band Old Dominion and Michael Ray, who recently notched his first No. 1 hit. Chase’s own single, “Gonna Wanna Tonight,” continues its steady climb up the Top 10 on Mediabase this week. It is the second single from his chart-topping major label debut album, Ignite The Night. As previously announced, Big Machine Records’ raucous trio The Cadillac Three will open for Chase on most dates of the JD and Jesus Tour, and chart-topping Black River Entertainment artist Kelsea Ballerini will perform as a special guest at select shows. Fans will also have the opportunity to win a round trip and VIP admission for two to Chase’s Nov. 12 show at The Tabernacle in Atlanta, Ga. courtesy of Shazam and Head Down Eyes Up. For more details or to enter the sweepstakes, click here.